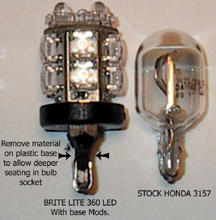 Look at these notes and pictures to help make a 3157 LED fit properly into the stock Honda bulb socket. Because the stock Honda turn single bulb is an all glass wedge type bulb, the industry standard plastic base 3157 bulb is a little thicker and wider, keeping it grom seating firmly into the Honda bulb socket. By carefully taking some material out, with a dremel tool or utility knife, you can make the Brite Lites 3157 LED bulb plug in firmly and stay put. We have had many customers perform this and it works great. It is the only way to convert a Honda to this type of LED bulb without changing the socket out on the bike.